Grow healthier plants faster! 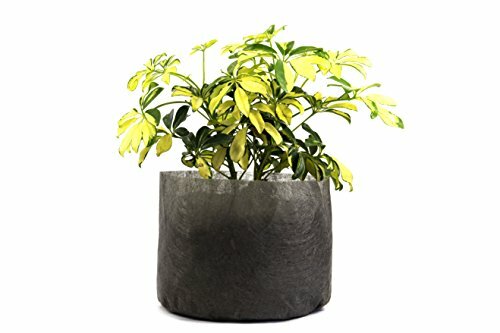 Fabric pots help your plants grow healthier, bushier root systems and virtually eliminate overwatering. These pots combine the benefits of fabric pots with the affordability of grow bags! Available in sizes from ½ gallon up to 200 gallon. Ruth's Fabric Pots are sewn from plastic mesh fabric. Our mesh fabric has holes small enough to keep dirt in, but allows for easy drainage of water, and improved air circulation. Our lightweight fabric allows for better air flow and drainage than heavier fabric or plastic pots. Ruth's thinner, high strength mesh keeps soil moisture more even and makes it almost impossible to over water plants. Our mesh fabric grow bags automatically air prune roots which eliminates problems of plants becoming root bound and creates healthier root systems for better growth. Favored by commercial growers for our combination of improved plant health and price. Made in the USA. Originally developed on our working Iowa farm by gardeners for gardeners. Inexpensive enough to be disposable but strong enough to wash and reuse. Tear resistant, won't fray. Ruth's Tree Farm Flat bottom Pots stand up on their own for easy use. Available in 1/2 Gallon, 1 Gallon, 2 Gallon, 3 Gallon, 5 Gallon, 10 Gallon, 15 Gallon, 25 Gallon, 30 Gallon, 50 Gallon, 75 Gallon, 100 Gallon and 200 Gallon sizes. Handles optional on our 2 Gallon through 15 Gallon sizes. Order Now for healthier happier plants! Fabric Grow Bags sewn from plastic mesh fabric - 5 Gallon 100 pack 12" x 10"
If you have any questions about this product by Ruth's Tree Farm, contact us by completing and submitting the form below. If you are looking for a specif part number, please include it with your message.